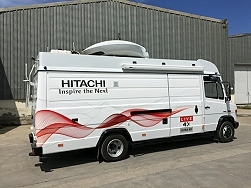 Hitachi to showcase DSNG/OB truck in Singapore. Singapore, May 2016: Hitachi Kokusai Electric is to showcase its new DSNG/OB truck at BroadcastAsia 2016 which begins in Singapore on May 31st. This is the first time the unit will have been exhibited in Asia. The company says the vehicle - which was developed at its facility in Istanbul - offers advanced flexibility and technical performance to include 4K capabilities. The truck is based on a Mercedes Vario and can support up to six fiber, wireless system and PTZ cameras. Communications are provided via a 150cm antenna and a 15m mast.